I attended a ‘Reel Life’ interview with Brian De Palma yesterday at the Edinburgh Film Festival here in Scotland. De Palma spoke a little bit about The Black Dahlia too, though the focus of the event was mainly the New American Cinema. When asked about his favorite actors (whom De Palma has worked with), he mentioned that he worked with several talented British actors on The Black Dahlia, most notably Fiona Shaw, whom he thinks “can do anything”. De Palma said that he originally read The Black Dahlia about 15 years ago and thought it was a very good novel but would also be very difficult to adapt to the big screen. After seeing L.A. Confidential and how well James Ellroy’s novel was adapted to a script, he regained hope and when he read the script of Dahlia, he thought it was quite good. He mentioned that David Fincher (who was originally supposed to direct Dahlia) and Ellroy worked on the picture for nearly a decade and by the time De Palma got on board, Ellroy was not so involved with the project anymore. But De Palma has the utmost respect for the writer and how multi-layered his stories are. Over all, Brian De Palma came off as a very confident filmmaker and he was not shy to voice his opinion on the state of contemporary American cinema. He mentioned that he loves to go out and see films and often when he does, he is reminded to go back to work to be able to deliver something good for the audience. But he is very much inspired by film festivals and thinks today’s independent cinema has a lot to offer. He did not mentioned Scarlett Johansson in this interview but a funny co-incidence, he did mentioned a couple of things indirectly related to her. When asked what he thought about Mission: Impossible 3 (a film that Scarlett was supposed to do), De Palma rolled his eyes furiously (he was not shy on mentioning his thoughts on Tom Cruise either and the fact that he did Mission: Impossible for commercial reasons). He also mentioned that he dislikes filmmakers like Michael Bay (director of The Island) and how they shoot action scenes by cutting so fast that you can hardly understand the big picture and the physique of the characters at all. I am leaving for the Venice Film Festival in about a week from now to attend the world premiere of Scarlett’s latest film, The Black Dahlia on 30th August. If other fans are planning to attend and would like to meet up for the red carpet ceremony, feel free to email me at riikka@scarlett-fan.com and we’ll chat more. I will also try to come by to post my review of the film the next day! Posted on August 15, 2006 June 2, 2008 Written by RiikkaComments Off on Esquire: Who is she? As some of the fans are already aware, Esquire magazine is running a story where they partially reveal the identity of their Sexiest Woman Alive over the course of six months. Each month they have a partially revealling photo and a 20 question interview. The readers have made the guess in a poll that she is Renee Zellweger (53%) with Scarlett running right behind with 27%. The mystery lady sure does sound and look a lot like our Scarlett but I recommend for you to have a look and make up your own mind. Thanks to Peta informing me that Scarlett made a low-key visit to Auckland, New Zealand last week, which she spent supermarket shopping, buying take-aways and driving around town with Josh Hartnett in an environmentally friendly eco car. Josh is currently in town to film 30 Days of Night and Scarlett accompanied him on set. Hello from the good ole rainy Scotland! Still no flat but I just had to come by to post this fabulous find! One of my favorite websites, The Film Experience has been having a Scarlett Johansson week with lots of goss and chatter about our girl. Check out results of their poll here; the readers have voted Lost in Translation as Scarlett’s best performance with 51% – Match Point and Girl with a Pearl Earring follow. 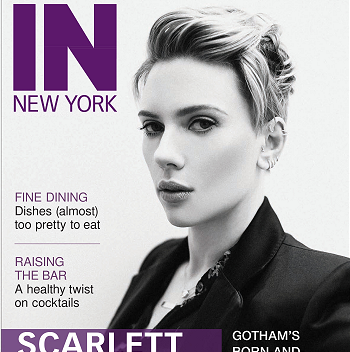 The blog also has awesome musings on Scarlett and her career. They even voted Scarlett-Fan.com as the best Scarlett Johansson website! These photos are all of Scarlett celebrating Lost in Translation at various bashes, premieres, festivals. For thousands more (you heard me right) —or if Scarlett week had you all hot and bothered, visit Scarlett Fan. It’s a huge spiffy website. If all movie actors had websites this comprehensive the world would be a better, prettier, happier, more satisfying place. Film siren Scarlett Johansson might be coming to Australia for a promotional tour later this year. The star is in negotiations to attend a premiere for the film Black Dahlia, which is due for release in November. A film insider has revealed Johansson and her co-star Josh Hartnett are likely to travel to Australia to promote the film, which has been chosen to open the Venice Film Festival. The movie Scoop opens today. Woody Allen wrote, directed, ed ited, co-stars in it. Also probably sells popcorn for it, takes your tickets and acts as the pro in the men’s room. In this thing, Scarlett Johansson’s a college reporter who happens to accidentally happen upon a major scoop. And if you believe we weary old broads actually nail exclusives that way, then I have five miles of swampland in Jersey I want to unload on you. Scarlett Johansson, whom I’ve met before, is as saucy, sassy, gorgeous, fun, talented and bright in real life as in reel life. Our reunion Wednesday was on an escalator. Traveling downstairs to the theater in MoMA for the screening. Wow – the first teaser trailer footage of The Black Dahlia is out now for your viewing pleasure at YouTube – and it looks absolutely breath-taking! Only a few quick climbses at Ms. Johansson, though. It looks like it was shown on Access Hollywood so I would assume the full trailer will be up online by this weekend! I had no idea about this before but apparently Scarlett was on Good Morning America this morning. Thankfully the website has a video clip of it up so be sure to check it out! And just a quick reminder that Ms. Johansson will be a guest on Late Show with David Letterman tonight. Be sure to tune in! Reebok has signed a multi-year partnership with one of Hollywood’s most captivating young actresses, Scarlett Johansson. The 21 year-old beauty has partnered with the brand to co-create Scarlett “Hearts” Rbk, a fashion-forward, athletic-inspired footwear and apparel signature collection debuting in spring 2007 at high-end department stores and boutiques around the world. The line will be grounded in sport and will feature head-to-toe looks designed to take today’s multi-dimensional woman from the studio to the street in style. In addition, the star of acclaimed films including “Match Point” and “Lost In Translation” will be featured in Reebok’s new global women’s advertising campaign breaking in spring 2007. Originally set for US release on October 27th, Touchstone decided to move The Prestige up a week to October 20th. According to their website, The Black Dahlia will see its world premiere and open the 63rd Venice Film Festival on 30th August 2006. It will also be presented in competition. The all star cast, including Scarlett Johansson, have been confirmed to step on the red carpet in Venice’s (Italy) Lido island.